The Blog Official first day! 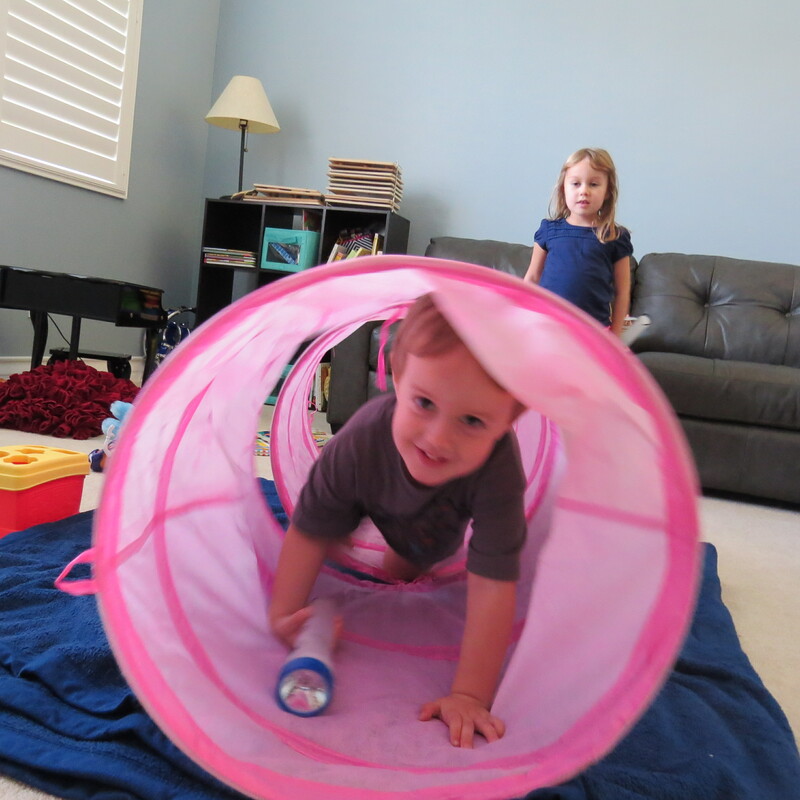 Despite our extra curricula activity set back, we forged ahead and did our 1st day of homeschool. Officially. Yikes. I decided to use My Father’s World as our core curriculum. This was a huge decision for me. I went back and forth between Sonlight and MFW. Ultimately I decided on MFW due to the fact that I really wanted to incorporate Mini Man as much as I could, so I need a Kindergarten curriculum that could adapt to a Pre-K level. MFW had more hands on and seemed slower paced, which seemed to fit this need. Sonlight is a wonderful curriculum and if I only had Ariel to work with, I might have gone this direction. We started with traditional blanket time with our good morning song (I made it up last year), looking at the calendar, singing the Days of the Week song, and reading In the Beginning from our children’s bible. 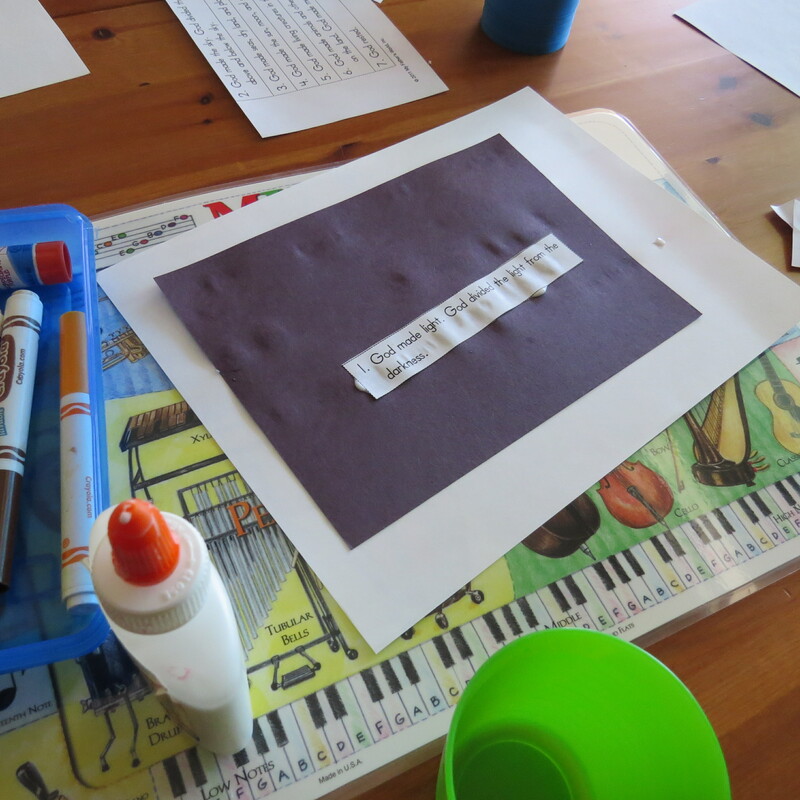 The kids seemed to really love the routine since this is a similar format that we did with our little co-op for preschool last year. Next up was our first week with MFW. First lesson focuses on Creation. They suggest taking a full 10 days to explore this big concept, but I feel like we won’t need to do that. We will focus only on the 7 days that the Lord took (including His day of rest). Plus, since we are starting later in the school year than most of our peers, this gives us a chance to catch up a bit. We are doing the recommended activity of making a Creation book. First day is gluing black paper onto white paper. easy breezy. After craft time with Ariel, Mini Man AND Little Rascal, we decided to play with light. FLASHLIGHTS! It was their idea to find utter darkness underneath our dinning room table. Ariel decided that we should use the flashlights for good, meaning rescuing her pink teddy bear. I loved watching the creativity working. 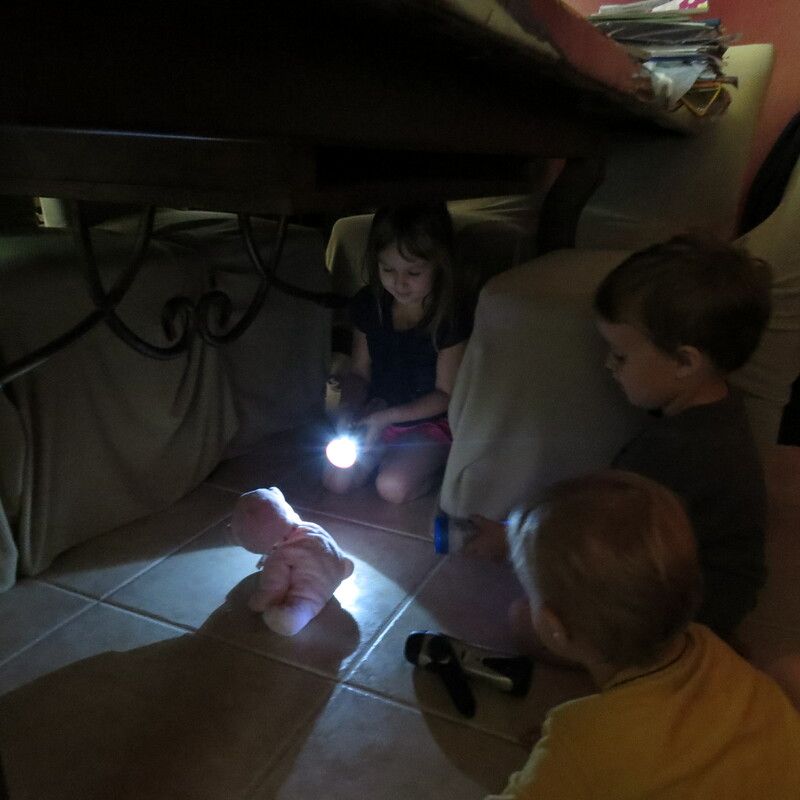 They decided to take this flashlight hunting/rescuing adventure into the great outdoors living room/homeschool room with tunnels, blankets and pillows. While the boys had their quiet time/nap, I decided to take the opportunity to read one on one with Ariel. I read 2 books with her and she read 2 books from *Readers Express* to me. I was impressed at her ability to actually read already.